When establishing a business architecture all of its components must be taken into consideration. Whilst it may be tempting to ignore technology as being out of scope (by saying it will be covered within a Technical Architecture) it is absolutely essential that it be included, if only at a high level. To ignore the contribution (existing and potential) and the impact that technology has within the business will compromise the decision making process and potentially lead to lost opportunities. As an enabler, technology provides a platform upon which many of the business’ Capabilities, Functions and Processes are executed. Without understanding of what the technology can offer many aspects of the business could fail to materialise or could perform so poorly as to be a liability rather than an asset. With understanding, the opportunity to increase business benefit, through perhaps increased or improved process automation, is enhanced.. 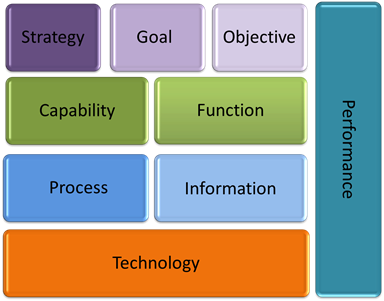 When assessing the capability to deliver against its Strategies, Goals and Objectives business, awareness of what technology does and can provide, gives needed information when deciding and prioritising what is required to increase business maturity. The business does not stop at IT but encompasses everything needed to deliver a successful outcome. IT is part of the business.